Life on the streets can be hard — just ask Sid. All you need to do is look at her sweet face to see the years of pain and suffering etched across it. And yet, she still smiles. 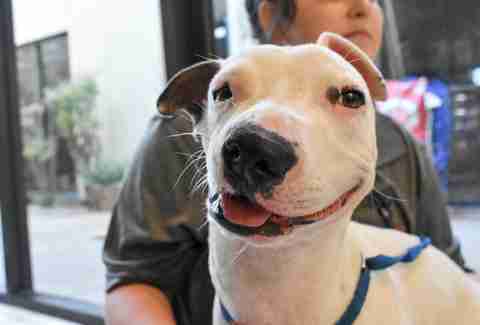 Picked up as a stray on the streets of Fort Worth, Texas with a small puppy by her side, the white Canaan dog desperately needed a second chance. 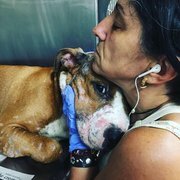 Her rescuers immediately noticed her odd lopsided expression, making the young dog appear perpetually quizzical, along with a scar reaching down the right side of her face. 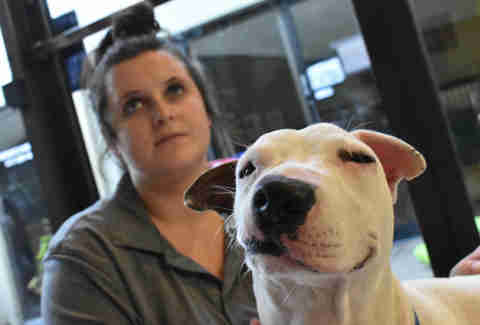 At Fort Worth Animal Care and Control, shelter staffers discovered that not only was half of Sid’s face paralyzed from a traumatic injury, but she was deaf, too — something fairly common in white dogs. Despite her injuries, Sid proved to be an incredibly loving mom, doting on her puppy though she couldn’t hear his yips. With Sid’s health issues, her chance of finding a family was slim. 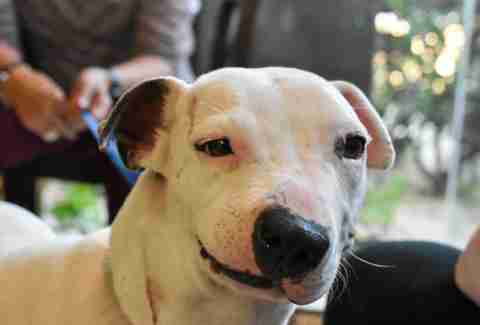 Most likely, she would languish away in a city shelter until her time ran out. But shelter employees refused to let Sid slip through the cracks. A rescue coordinator at Fort Worth Animal Control contacted Animal Hope, a rescue and rehabilitation center specializing in animals with behavioral or medical care needs. On October 2, Sid arrived at Animal Hope, and has finally been able to relax for the first time in her life. Remarkably, Sid refuses to let her past get in the way of a good time. “It's hard to get pictures of her because her head is always moving,” Morris says. After overcoming incredible odds, Sid deserves a loving family who can care for her. As the old saying goes, beauty is in the eye of the beholder, and Sid’s can’t help but shine through. 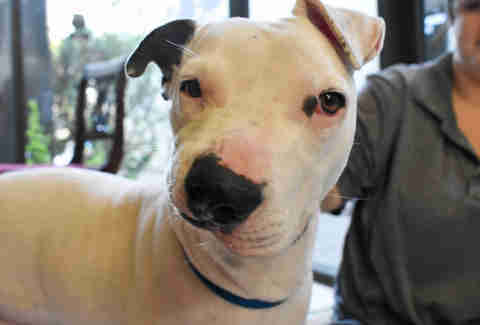 For information on how to adopt Sid, email info@animalhope.org. To support Animal Hope, visit its donation page here.